When the campaign was finally over, the media almost immediately viewed Barack Obama’s victory as a transformational event, and a subject that had been in some ways taboo moved front and center — race. 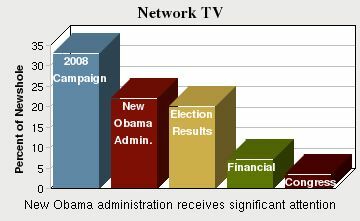 “Obama Overcomes,” observed the Tuscaloosa Alabama News. “Dream Realized,” said the Brockton Massachusetts Enterprise. “Race is History,” emphatically declared the Beaumont Texas Enterprise. Another common theme in the torrent of analysis and reporting that followed Obama’s win over John McCain on Nov. 4 was disarray in a Republican Party with a damaged brand and diminished base. And that seemed to be epitomized nowhere more clearly than in the widely publicized comments belittling Sarah Palin, attributed to anonymous McCain aides, and the subsequent counterattack by Palin. While some commentary and reporting also suggested the nation was on the cusp of a major political realignment, the media verdict on that was more mixed. One other major storyline emerged in the media last week. With the political press corps still fully mobilized and a deepening economic crisis, the narrative pivoted instantly to speculation about the personalities and policies that would drive the new Obama administration. Within a day, the transition from one presidential era to another was in full swing. These are among the findings of the weekly News Coverage Index, a comprehensive analysis of the press coverage the week of Nov. 3-9 from the Pew Research Center’s Project for Excellence in Journalism. In the final week of a campaign, the presidential election utterly dominated the news agenda. 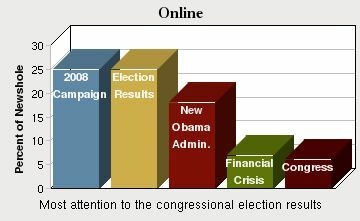 Campaign- and election-related themes combined to make up more than two-thirds (69%) of the newshole studied. Combined, that would make the election and its aftermath the largest single event in the 22 months since the Index began. When you add in the additional stories connected to the Nov. 4 voting — including the U.S. House and Senate races and ballot questions — that number swells to almost 80%. 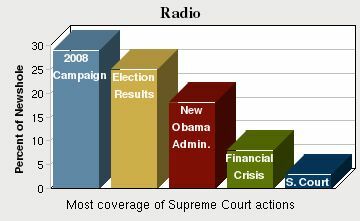 Three main election themes dominated the coverage. The end of the presidential campaign — which encompassed coverage on just two days, was the No. 1 story, accounting for 27% of the week’s newshole. Coverage of the election results — including straight reporting and analysis — was No. 2, filling another 21%. And coverage of the incoming Obama administration — which began on Nov. 5 and looked forward — was right behind, also accounting for 21% of the newshole. The News Coverage Index is PEJ’s running content analysis of media coverage from 48 different news outlets from five different media sectors, print, online, network, cable and radio. 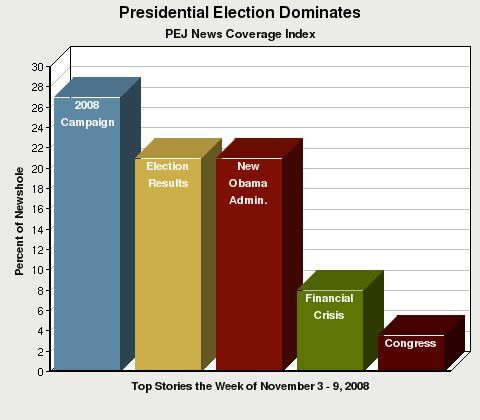 During the election year, PEJ added special coding to more closely examine coverage of the race for president and renamed the work the Campaign Coverage Index. 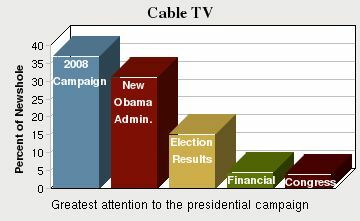 The CCI measured both the nature of the campaign narrative and the amount of coverage devoted to each candidate. (This “race for exposure” was measured by the number of stories in which a candidate plays a significant role — as a subject of between 25% and 50% of the story — or a main newsmaker role — at least 50% of the story.) This week’s analysis includes the last two days of the campaign, Monday and Tuesday of last week, and includes some of this data. As such, it represents the final CCI report. As soon as the votes were counted on Nov. 4, the media began trying to figure out the lessons. Three themes — campaign post-mortems, the historic significance of the vote and an examination of demographic and voting trends — accounted for almost two-thirds of the election results newshole. There was less doubt when it came to the social and racial significance of the Obama victory. Here, the media verdict was unabashedly emotional and unequivocal. “Obama Reaches The Mountaintop,” declared the headline in the Newark Star-Ledger, a reference to one of Rev. Martin Luther King’s most famous speeches. “How do you measure the magnitude of a moment such as this, the election of the first African-American president?” asked ABC anchor Charles Gibson at the top of his Nov. 5 newscast, as a collage of emotional celebratory scenes rolled across the screen. A story posted on CNN.com described Obama’s victory as a “personal triumph” for some of those who had taken part in the country’s early civil rights battles. “Some [white southerners] risked social rejection for renouncing the bigotry of their parents,” the story asserted. “Others risked their lives while leading civil rights campaigns in the Deep South. Some almost lost their belief in the inherent goodness of America because they saw so many innocent people die.” One of the unlikely Obama supporters mentioned in that piece was Peggy Wallace Kennedy, the daughter of the late Alabama governor and segregationist George Wallace. Within a day, however, given the supersonic news cycle, the celebratory transformative post-mortems quickly gave way to coverage of the makeup and priorities of the new president. The tenor of the coverage generally seemed to suggest a sense of urgency. With two wars and an economic crisis, the media depicted a transition that required an unusual level of coordination between incoming and outgoing administrations. A Nov. 9 Washington Post story — quoting a historian who compared Obama’s challenge to that facing Franklin Roosevelt in 1932 or Abraham Lincoln in 1860 — reported that Obama aides were already preparing to work next to Bush administration Treasury officials. The biggest chunk of the coverage of the new administration, about one-third, focused on potential Obama appointments, with everyone from Colin Powell to Caroline Kennedy being bandied about. About the same level of coverage also focused on the economic policy agenda and speculation about the priorities and ideology of the new administration. When it came to that first storyline, appointments, the only actual news came with the selection of Illinois Rep. Rahm Emanuel as chief of staff, a move that triggered considerable coverage of both his political skills and fiery personality. One such story, in the Nov. 7 Arkansas Democrat Gazette, reported that “some Congressional Republican leaders are critical of the partisanship Emanuel brought to his job in the Democratic leadership.” Emanuel supporter, former Commerce Secretary Bill Daley, responded by insisting the incoming chief of staff was a changed man. When it came to the question of the new administration’s policy agenda, much of that focused on Obama’s plans for the economy, a subject that was very much in the center of his Nov. 7 press conference. And some coverage examined the kind of leadership he might offer in troubled times — often without drawing any clear conclusions. All this came after the voting. The last two days of the campaign itself were still the top overall story the week of Nov. 3-9. As had been the case in the two previous weeks, the biggest component of the campaign storyline was the battle over the crucial swing states, many of which went to Obama on Nov. 4. All told, themes concerning the horse race aspect accounted for more than one-third of the week’s campaign newshole. And as the tactical and strategic and polling stories came to dominate the waning hours of the campaign, policy questions became an afterthought. For the week of Nov. 3-9, issue differences between Obama and McCain accounted for only about 5% of all the campaign coverage. That includes the combined total for such subjects as the economy, terrorism, energy and Iraq. In the last two days of the race for the White House, Obama once again generated more coverage than McCain. He was a significant or dominant factor in 60% of the campaign stories compared with 50% for McCain. Although McCain had pulled even with Obama in the battle for exposure from mid-September through mid-October, the Democrat generated significantly more coverage than his rival during the course of the entire general election season. From mid-June through Election Day, Obama was a significant or dominant factor in 66% of the campaign stories compared with 53% for McCain. Throughout this long campaign, the Illinois senator consistently proved to be the top newsmaker. Not only did he generate more coverage than McCain in the general election, but during the Democratic primary period — from Jan. 1 through June 9, 2008 — he also received more attention than Hillary Clinton, by a margin of 55% to 48%. With about 80% of the newshole focused on the election and the transition, there was little news left over. Indeed, only three of the top 10 story lines last week did not involve some aspect of the Nov. 4 elections. Much of that was taken up by the economy. The continuing financial crisis was No. 4 and filled 8% of the newshole studied in PEJ’s News Coverage Index. That’s down from 13% of the newshole the previous week as coverage of the economic crunch has steadily decreased since peaking in late September. The other two stories make the top 10 list last week were the civil war in the Congo and the immigration debate, both of which accounted for 1% of the newshole. 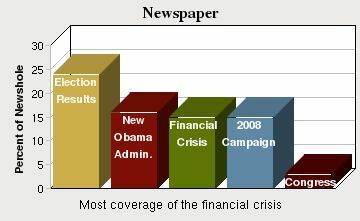 For more about campaign coverage see journalism.org. Democrats Dominate Media on Single Theme: Is Clinton Done?